"There are keener griefs than God. / They come quietly, and in plain daylight, / Leaving us with nothing, and the means to feel it." -Christian Wiman, "This Mind of Dying"
I was led back to poetry by the love and death of our infant son. And from here I deepened my commitment to my spiritual studies, as well as my poetry, as a way to survive the sometimes crushing grief. And yet I must ask myself: why wouldn't I write this fiercely, and openly, about the grandeur and mystery of my own riven cosmology, complete with its epistemological ruptures and transcendent griefs and joys? Reading Wiman spurs me forward in this way. And so, I have just ordered his aptly titled Ambition and Survival: Becoming a Poet from Powell's Books, and will await the release of Every Riven Thing with interest. Meanwhile, for those curious, two of Wiman's poems are available in the online edition of Harvard Divinity Bulletin (Winter 2008). At this stage, all I can say is "thank you," first to Wiman for making spiritual music in a medium obsessed with secular speech, and second to my own naive instincts, which led me to this personally significant new vein of gold. Categories: Grief Recovery, Insights, Life, Poetry, and Spirituality. 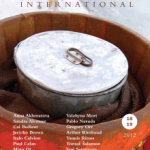 Tags: Poetry International. Poets: Christian Wiman.